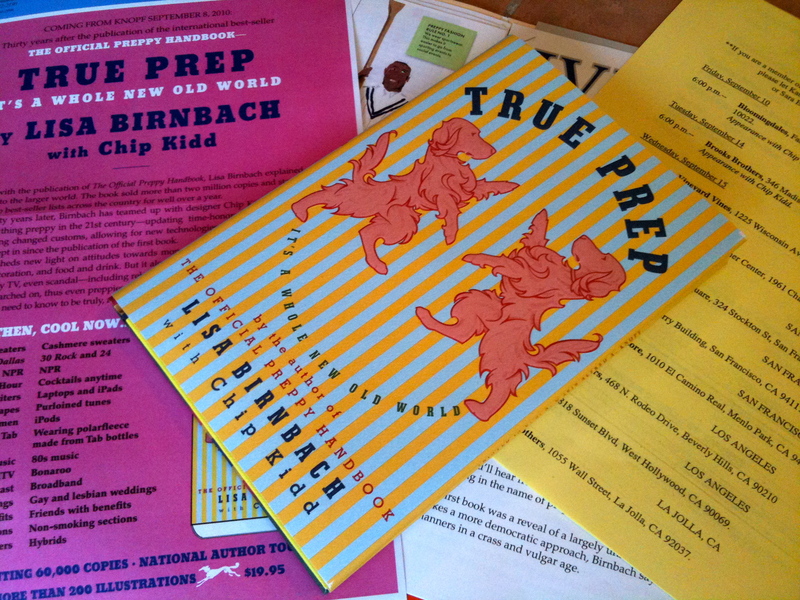 Our initial copy of True Prep arrived Friday, along with the press kit; to say we were excited would be an understatement. We have been busy scanning the book, looking at all of the great illustrations and photos and going through the marketing materials. One of the more notable items in the kit, the dates and locations for the book tour: this is not your standard book tour, not by a long shot. The majority of functions are not at bookstores, but at fun, fashionable prep locales, like LL Bean in Boston and at Tyson’s, Vineyard Vines in Greenwich and Georgetown, multiple Cole-Haan stores, and J. McLaughlin’s Charleston store. There are many book stores as well, including Powell’s in Portland, a fabulous establishment we have enjoyed visiting on many occasions. Another preppy icon, Sperry, figures heavily in True Prep promotion, with tour stops at several new Sperry retail stores: Kansas City, Dallas and Westchester. Sperry is also co-hosting events at several Nordstrom stores; can you say “merchandising opportunity”? Also well-represented on the calendar, Lilly Pulitzer, with functions slated for the Pink Magnolia in St. Louis, and the KOP (King of Prussia) Mother Ship store, in all of its remodeled splendor. Jenn over at the always-delightful Love List has more pictures of the fabulous re-do at the store, just click here. One other site sure to be a hit, the “For the Love of Lilly” exhibit at the Museum of Lifestyle and Fashion History is the location for a True Prep event. One of the major contributors to that exhibit is the very talented Kristina from Lotus and Lilly, she has more about it on her blog. The nearby Lilly store in Boca Raton will host Ms. Birnbach for a visit, near the end of the tour in December. Other retailers hosting events include the always-stylish Stubbs & Wootton, and jeweler Verdura. The material in the press kit indicates savvy marketing minds at work, with outstanding venues for the book tour, and word of solid merchandise tie-ins. (Although the stops are heavily concentrated on both coasts and in Florida, a few more in The Great Midwest would make us smile.) Methinks there will be several fun co-branded products with this one, not limited to the upcoming jewelry piece at Brooks and the Princess. 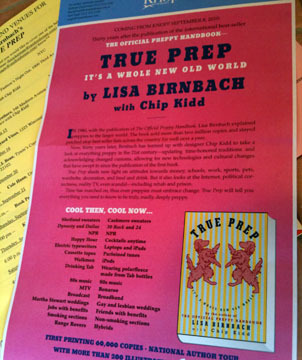 Our initial reaction to Ms. Birnbach’s latest offering is very positive, True Prep is similar in tone and tenor to The Original Preppy Handbook. We presume the light treatment of the topic is what most readers are looking for; the same irreverence that made TOPH such a hit is present in abundance, with lots of tongue-in-cheek comments and witty asides. We enjoyed our quick glance through the book, and look forward to settling in with it for a dedicated read, cover to cover. We hope to have our review posted at some point this week. One other note before we scram-a-rama, because we somehow have multiple copies of the Original Preppy Handbook, we’re thinking a giveaway offering one of each might be in order. Does that make sense? That number one post, Gossip Girls Hit the Hamptons, dates all the way back to June of 2008 and featured the cast shooting on location. The three argyle items are the sweater, socks and tie. The post also included actor Chace Crawford in a swarm (gaggle? herd?) of teenage girls. The rest of the cast is also seen in that particular post. Season four is confirmed, the next location shoot for the cast and crew is Paris. We know there are more that have come into the electronic in-bin, but we are so behind schedule we can’t list them all, please accept our apology. We leave you with these Pretty in Pink pillows from Thred, part of their Tropical Preppy collection. Holli at Thred is more than talented, we adore her creative pillows. With that, may everyone stay cool, stay safe and stay happy! The writer undergoes a preppish style transformation. Two photos accompany the piece, along the lines of “before prep” and “after prep”. We very much enjoyed this one. Another preppy feature in a mainstream media outlet comes via Sunday’s Los Angeles Times. There’s a visual for you – Muffy Martini’s ancestors raging through the streets brandishing their lax sticks and headbands at the offenders. The horror. Mr. Tschorn’s story mentions several lesser-known brands discussed in this space, including Band of Outsiders (although we have been more prone to chatting up the Boy by Band of Outsiders line, the women’s arm of the company), and Trovata, along with more well-known lines like Polo Ralph Lauren and Brooks Brothers. Per usual, Mr. Tschorn does another stellar job with his topic, the link is well worth a visit. We want to say ‘thank you’ to our friend Skip over at the Alexander Grant blog; as part of a series of posts he asked us to come up with style ideas for his real life Preppy Princess. We were only too happy to waste take a little time to endlessly graze oodles of fun websites to studiously dedicate ourselves to this cause. Indeed. With that, goodbye until next time! Happy, Happy, Happy Friday! Is it simply glorious where you are? Hopefully that is the case, spring has sprung in a major way here at the Prepatorium. The sun and gentle breezes are beckoning, and our resistance to stepping outside is waning. Rapidly. Therefore today’s post is short, touching briefly on a few morsels that may hold appeal. We begin with word of a fun post over at Refinery 29, “All Aboard for a Fresh Take on Nautical“. The story features all sorts of pieces with nautical influences, with some items coming from brands many readers enjoy, like Sperry and J. Crew, to others not commonly showcased in this space, such as Wren and Pixie Market. We very much enjoyed their take on the look. Author Lauren Sherman compares and contrasts several elements from each brand, a timely topic with LL Bean Signature officially launching over this week. While not terribly in-depth, the story does make an interesting read. We close with a few images in our “Friday Fun” category. The first is of a delightful customer heading out the door with her Lilly Market Bags. Our thanks to Brittnee for sharing with all of us! The second image is today’s Pretty in Pink, without a doubt, an item we originally learned about via our friend Bumby at the Preppy Chronicles. This would be a new Fiat 500C, not the first Fiat in pink, but it is the first convertible in our favorite shade. On that fun vision, we leave you with a reminder about our amazing Spring Fling Thing, and a hope that your weekend is utterly divine. You deserve it. Hello-Hello, happy rainy day! Yes, we are so gaga over the warmer weather we are happy about the rain, it is so much nicer than the snow! We think Joan Holloway and Betty Draper look simply smashing, their hair and makeup are captured perfectly, although Joan is nowhere near as curvaceous as on the show. But then, these are merely 11-inch dolls, oui? It’s official, American Eagle is closing all 28 of its poorly performing Martin and Osa stores. Stationery and gift retailer Swoozie’s has filed bankruptcy but hopes to keep most stores operational. In looking for recent updates we noticed the last time Swoozie’s Twitter account was active was Feb. 3, the company’s Facebook page is more current. We wish them the best, we always enjoyed a trip to Swoozie’s. We are intrigued by a line from across the pond, Polistas. Described by Luxist as “… the first true polo lifestyle brand made for polo players by polo players…”, the company is now launching a Polo Dress. We enjoyed bouncing about the Polistas website. We close with a few more looks from Paris Fashion Week, beginning with the Balenciaga fall collection, characterized by at least one trade magazine as “future prep”. We are guessing the crewneck sweaters from designer Nicolas Ghesquiere contributed significantly to this appellation. While there was some lovely pink and green in the collection we wouldn’t exactly refer to it as preppish. But doesn’t it look pretty, like candy, or Easter eggs? Remember when we chatted about Sperry opening retail stores in select locations? The Kansas City store celebrated its grand opening on Saturday and the liquid refreshments look dreamy. The clothes are also easy on the eyes, as is the footwear. If interested in the company’s 75th Anniversary CVOs seen above right, they are now available online. We initially stumbled on the party pix while gathering the info for today’s Pretty in Pink, the Seasonal Bahama. We shall pray to the retail Pooh-bahs for a Sperry store in our corner of the globe someday. Until next time dollfaces, grins and giggles!